A research team formed by Center for Earth Information Science and Technology (CEIST) at Japan Agency for Marine-Earth Science and Technology (JAMSTEC), Mitsubishi Jisho Sekkei Inc. and Takenaka Corporation carried out uninterrupted three-dimensional observations and high-resolution simulations for the courtyard in Marunouchi Park Building located in the center of Tokyo (Otemachi, Marunouchi and Yurakucho areas). As a result, the cooling effects of trees were elucidated in green spaces surrounded by skyscrapers. This research aimed to understand to what degree urban green spaces in high-rise buildings contribute to improvement of the thermal environment. In cooperation with Nippon Institute of Technology, Mitsubishi Jisho Sekkei Inc. and Takenaka Corporation made three-dimensional observations of air temperatures, tree crown temperatures and wind velocity around Marunouchi Park Building during summer nights in 2012 and 2013. Then, the temperature decrease was observed in the green courtyard. The observation data imply that the cooling in the courtyard is attributed to the trees. In order to clarify specific mechanisms of the cooling in the courtyard, JAMSTEC carried out the thermal environment analysis by conducting a high-resolution numerical simulation using the MultiScale Simulator for the Geoenvironment (MSSG)*1 with newly-developed physics models on the Earth Simulator supercomputer system. The simulation successfully reproduced the cooling in the courtyard similar to that observed on-site, clarifying that the cooling is caused by radiative cooling*2 and transpiration*3 effects. This pioneering research was realized by cooperation among three parties: 1) Mitsubishi Jisho Sekkei Inc., which is responsible for designing and supervising Marunouchi Park Building; 2) Takenaka Corporation, which has equipment for three-dimensional meteorological observation with measurement and analysis skills; and 3) JAMSTEC, which has sophisticated simulation technologies for thermal environments with the Earth Simulator. These results are expected to contribute to designing more comfortable outer spaces in urban cities and also considering measures against global warming and heat island in city planning. A multiscale atmosphere-ocean coupled numerical simulation model considering global, meso- and urban scales. Meteorological simulation models are typically developed to conduct simulations in one of those scales, but MSSG is developed to treat all of those scales considering physical interactions between the scales. It is cooling of the surface temperature of ground, building walls and tree leaves caused by heat loss due to thermal radiation from the surfaces. It frequently occurs under nighttime clear-sky conditions. Thermal radiation is an emission of radiation (typically infrared radiation for the case of ground, walls and tree crowns) from heated surfaces, on which temperature the thermal radiation intensity is dependent. It is the process where water contained in leaves is converted to vapor and released to the atmosphere through stomata on the leaf surfaces. It helps leaves stay cool because the evaporation of water draws heat during the process. 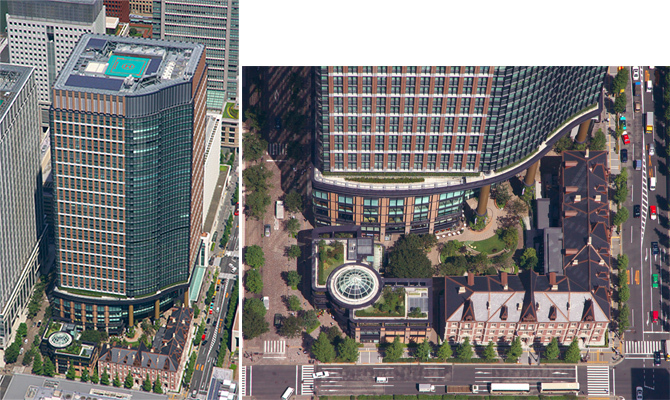 Left) The entire Marunouchi Park Buidling with the high-rise tower (height: approx.167m). Right) Courtyard from the above. In addition to the grass courtyard, the roof and walls of the annex buidling (front left) are coverd with green. The highest tree in the courtyard reaches 17 meters. Figure 2: Photos of observation equipment placed at Marunouchi Park Building and mesuraement data by a thermal imaging camera. The below diagram shows observation data between August 7th and 8th in 2013: 1) temperature at A point in the center of the courtyard (blue line); 2) horizontal wind velocity (brown line) at A point; 3) temperature at C point outside the courtyard (dotted dark brown line); and 4) surface temperature of tree crowns measured by the thermal imaging camera (green line). The wind became weak for several hours after 0:45a.m when the temperature in the courtyard (A point) remarakably decreased, while it didn’t outside the courtyard (C point). The thermal imaging camera data on the tree crown temperatures also caught the temperature decrease. Since it occurred slightly earlier than the temperature decrease in the courtyard, the tree crown temperature is likely to contribute to the temperature decrease in the air. Figure 3: Comparison of data observed by the 3D anemometer placed in the center of the courtyard and those obtained by the numerical simulation. The left shows time varaiations of wind velocity and the right those of wind direction. The observation data by the 3D anemometer (shown with brown color) show reduction in the wind velocity and change in the wind direction during hours between 0:00am and 3:00am. The corresponding trend is observed in the wind velocity and direction data obtained at the same point in the numerical simulations (shown with blue color). 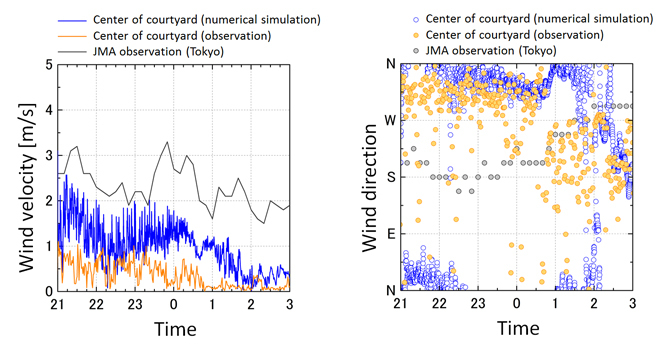 The trend of wind direction and velocity observed in the courtyard is different from that of AMeDAS data by the Japan Meteorological Agency (shown with grey color; the observation point is set at 35 meters above the ground near Marunouchi). It is, therefore, considered that the trend occurred locally due to the geometry of the buildings around the courtyard. 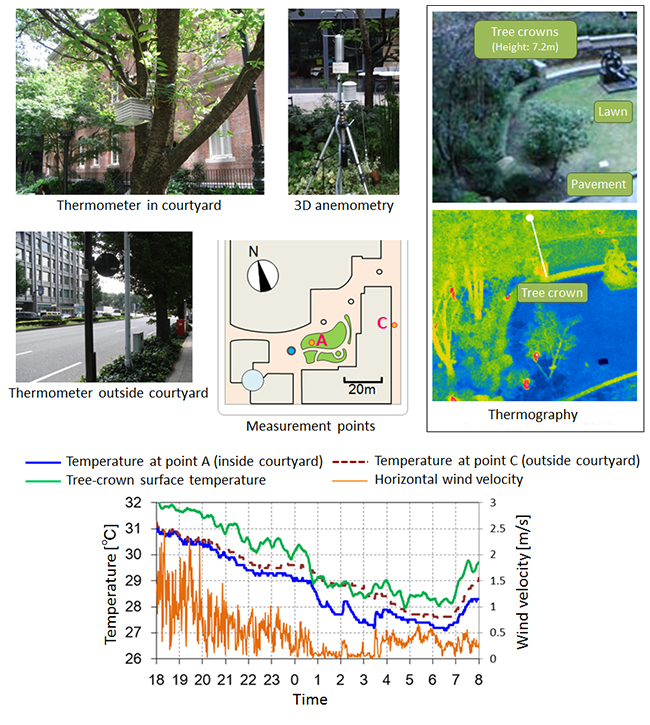 Figure 4:The numerical simulation results showing distributions of tree crowns and temperatures around the courtyard at Marunouchi Park Building. The isosurfaces representing a temperature at 2:30a.m. (10-minute average value) is shown three-dimensionally with semi-trasparent surfaces ((temprature increases in order of blue, yellow and red). The left shows the couryard with trees and the right without trees.